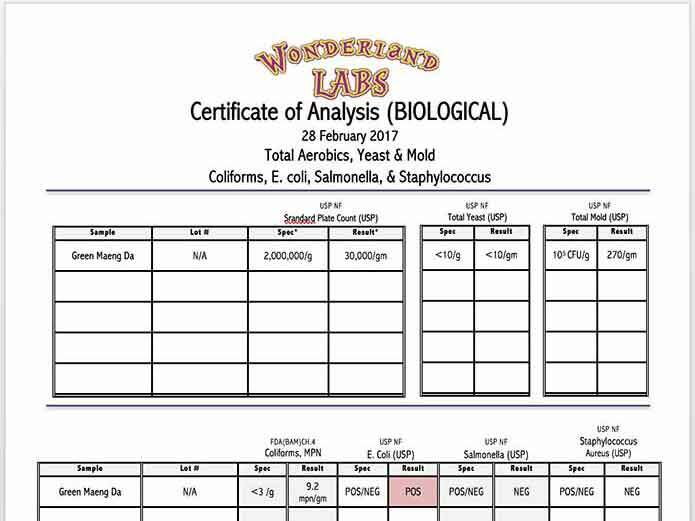 This is one of those lab testing surprises: We don’t see Kratom with biological contaminants very often, but for some reason, recent products from various suppliers have come up positive for E. coli or Staphylococcus in a larger percentage than ever before. We’re not sure why this might be; perhaps as demand grows, there is less care taken in harvesting the Kratom plants. In this Green Maeng da sample, it came up very positive for alkaloid content; stronger than most of the Green Maeng da that we’ve seen over the past year at 1.7%. This was exciting news, but the fact that it came up positive for E. coli means that if anyone consumed this product, there is a very distinct possibility of serious illnesses with anyone who purchased the product. The GREAT NEWS is that before this client purchased a large quantity of this product from their supplier, they saved a potential disaster for a $99.00 investment. Now, I don’t mean to be alarmist, because most of the Kratom samples we receive come up negative for any pathogens whatsoever. 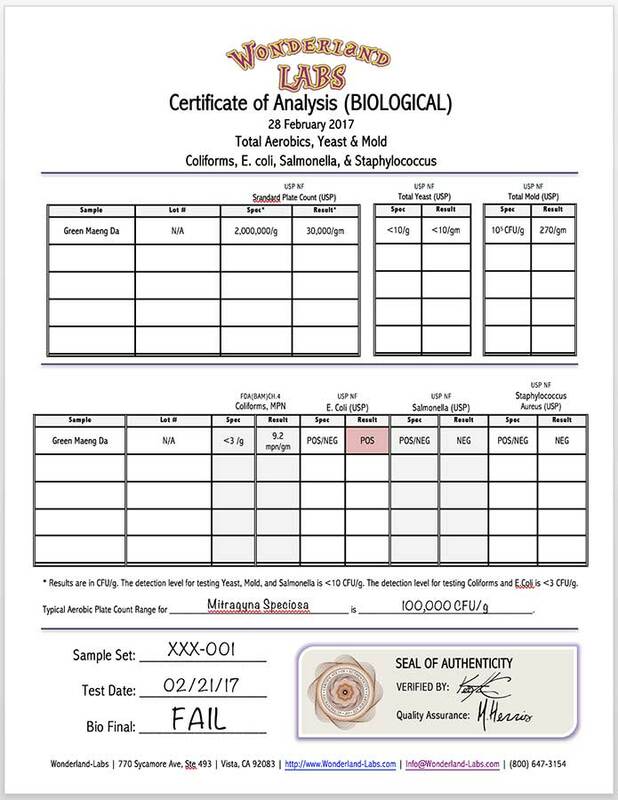 Even the mold count in most of the Kratom (Mitragyna speciosa) leaf powder we receive is relatively clean of both biological contaminants as well as heavy metal content well within established limits by the FDA for consumable products. Mind you, it’s not technically legal to sell Kratom for consumption yet, but it is important to know if any product being offered to customers has pathogens in it. E. coli is easily transferred from the Kratom powder to your body, through simply handling it, and then contacting your eyes, mouth, nose, or eyes.